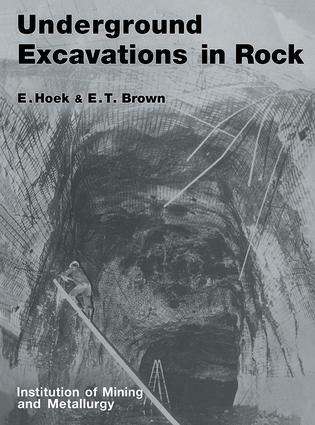 Underground Excavations in Rock deals with the geotechnical aspects of the design of underground openings for mining and civil engineering processes. 1. Planning Considerations. 2. Classification of Rock Masses. 3. Geological Data Collection. 4. Graphical Presentation of Geological Data. 5. Stresses around Underground Excavations. 6. Strength of Rock Masses. 7. Underground Excavation Failure Mechanisms. 8. Underground Excavation Support Design. 9. Rockbolts, Shotcrete and Mesh. 10. Blasting in Underground Excavations. 11. Instrumentation. Appendices. Index. Evert Hoek, D.Sc(Eng). Consulting Engineer, Vancouver, B.C., Canada. Edwin T. Brown, PhD. Deputy Vice-Chancellor, University of Queensland, Brisbane, Australia.